On 4 October 2018 in Budapest, Hungary, the EIT’s Innovation Forum ‘INNOVEIT 2018’ will bring together entrepreneurs, representatives of higher education and research, EU, national and regional policymakers, as well as EIT graduates and other key innovation actors. The EIT Awards promote innovation and encourage entrepreneurs by putting the most innovative ventures, entrepreneurial graduates, innovation teams and women from the EIT Community in the spotlight. They create role models for change. Choose which innovation you think should win EIT Public Award 2018 and vote here! 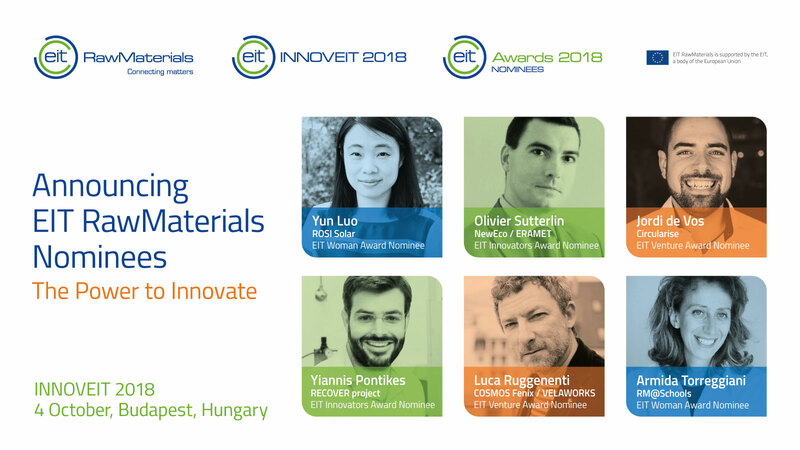 EIT RawMaterials has nominated the following six nominees. The EIT WOMAN Award recognises the outstanding achievements of women entrepreneurs and leaders from our Innovation Communities. Armida Torreggiani leads an active learning project the Raw MatTERS Ambassadors at Schools (RM@Schools) introducing a methodology to improve the image of science and technology in schools. RM@Schools has achieved success and recognition by involving experts from EIT RawMaterials to engage students in experiments, and efforts to disseminate the results of those experiments. I have always wanted to be a change maker. Actually, everyone can be a change maker if she/he has a goal to reach, is not afraid to share her/his capabilities and talents with the others, and to face issues. I know well the importance and the beauty of science and technology, but I frequently see indifference and scarce interest towards them among youngsters. In my opinion one of the reasons is related to the way science is taught in schools where too many teachers forget that “the mind is not a vessel to be filled, but a fire to be kindled” (Plutarch). Yun Luo, President of ROSI start-up, strives to drive the company to be a key player in sustaining the values in solar energy production. Green from Green, and back to Green! ROSI offers an innovative solution to recycle highly pure Silicon, either from “kerf”, an industrial waste resulting from the production of solar wafers, or from the Silicon fines as PV-Silicon production process loss. Recycling Silicon through ROSI’s leading technologies reduces at least 30% of CO2 emissions, increases production efficiency and reduces the cost of PV modules, thus, renders the PV industry into a truly circular economy. It was not my original idea to become an entrepreneur, but a changemaker yes. During my industrial career and life experience (to become a mother), I am more and more convinced that becoming an entrepreneur is one of the most straightforward and efficient ways to change the world, in order to offer the kids a better future. The EIT INNOVATORS Award recognises teams from our Innovation Communities that develop high-impact products and services for a sustainable future. Metals concerned by the NewEco project are vital for the European industry and the development of our society. This project, through the synergy between ERAMET and BOLIDEN allows Europe to keep producing on the European soil important volumes of strategic and critical metals which are used in a variety of final products for ICT, energy supply, mobility (automotive, aeronautics), food processing, equipment and machinery. The main societal impact is the European supply in high purity nickel, nickel salts, precious metals, copper, and PGM to the European market by two European industrials. All these metals are essential to the green economy and the energy transition. The program allows strengthening a whole European Supply Chain from mines to end products and creating added value in Europe. RECOVER innovation project uses secondary resources to produce high value-added construction materials. The project proposes that Fe-rich semi-vitreous industrial residues can be used as precursors for engineered fire-resistant and porous materials that can enter the European construction materials market. This disruptive innovation approach leads to products with lower environmental footprint and renders the metallurgical industries important raw materials suppliers that run integrated zero-waste processes. The EIT VENTURE Award recognises successful start-ups and scale-ups that have been supported by the EIT’s Innovation Communities through dedicated business creation and acceleration programmes. In Europe, the municipal solid wastes are treated by incineration process which generates millions of tons of fly ashes that are classified as “hazardous” and for this reason must be landfilled. COSMOS Fenix® is a new patented treatment that makes the classification of these ashes as “product” (end of waste) possible and creates an effective alternative to landfilling. Furthermore, the new powder can be used in polymers as filler and flammability tests have proved that COSMOS Fenix® is a tangible replacement of expensive Brominates and Antimony (Sb) few of them classified as toxic and/or carcinogenic for man and wildlife. VELAWORKS start-up is transforming hazardous waste ashes from non-recyclable waste thermal treatments into valuable secondary raw material usable as filler and flame retardant in plastic and rubber. I think the entrepreneur should have a vision for the future, should be brave enough to dare but humble to bring in and share the success with the team and with the right partners for its venture. Luca Ruggenenti, CEO at VELAWORKS s.r.o. Circularise goal is to overcome the communication barrier that is limiting current and future progress towards a sustainable economic model: the circular economy. Start-up web-based product tracking system can be applied in a virtually endless range of product value chains. The potential of these type of IoT solutions is therefore beyond imagination. In terms of raw materials and resources, this innovation will enable stakeholders in the value chain to get an oversight of the whereabouts of products/raw materials, to forecast the geographical buildup of deposits and to plan logistics and recycling activities for specific materials. This will result in a more focused recycling approach, a higher quantity and quality of secondary raw materials and ultimately securing European sources of (critical) raw materials. The key thing to do is to be aware of what you are doing and how others perceive it. And then do better, each and every time. No one will get it right the first time, but only real entrepreneurs keep trying every day. Even if you have success, learn to fail – a lot.